Ginger is a herbaceous perennial that originated in Southeastern Asia. It is in the same family as turmeric and cardamom and has some of the same health benefits as these spices. Ginger is available as fresh ginger root, powdered or ground ginger and crystallized ginger. 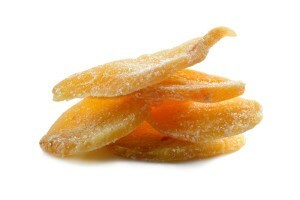 Appealing features of crystallized ginger is its portability and versatility. Crystallized ginger is fresh ginger root that has been peeled, sliced and cooked in a simple syrup. It is then sprinkled with sugar and dried. Making crystallized ginger is a time-consuming process. Buying crystallized ginger is often the most preferable way to add this healthy, tasty treat to your pantry. Once you discover the health benefits and the abundance of ways this spice can enliven your recipes, you may want to purchase it in bulk. You can store it in an airtight container and have it readily available to use in recipes or to grab as a sweet treat. One of the most outstanding benefits of crystallized ginger is its ability to ease motion sickness, morning sickness and general feelings of nausea. Ginger supports a healthy digestive system. It can also ease the discomfort associated with intestinal gas. Ginger provides support to your immune system. Another benefit of ginger is its ability to reduce minor aches and pains. It is especially helpful in relieving menstrual pain and joint and muscle pain. Ginger has anti-cancer properties and can protect against stomach ulcers. Adding ginger to your diet can reduce inflammation, improve cognitive function and block bacterial infections. Crystallized ginger can be incorporated into your diet in many ways. 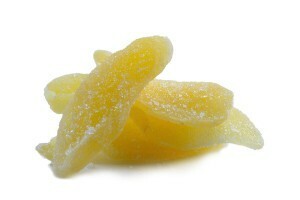 The simplest way to begin enjoying the health benefits of candied ginger is to eat a few slices each day. The slightly sweet, tangy and peppery flavor of crystallized ginger makes it a tasty, healthy snack. Slices of candied ginger can be placed in a small snack bag and slipped into your purse, pocket, desk drawer, backpack, gym locker or other convenient places to have on hand anytime your stomach feels a little queasy or you need an invigorating snack. Crystallized ginger can be added to main dish recipes and side dish recipes. It can make mundane vegetables such as green beans, broccoli or squash more flavorful. The peppery flavor of ginger perks up rice dishes. It adds amazing flavor to chicken dishes. It’s a wonderful addition to all types of baked goods such as cookies, pies, loaves of bread and more. Ginger flavored desserts are popular during the winter holiday season. Ginger butter is a treat any time of the year. Candied ginger enlivens dips and salads. You can get incredibly creative with ways to add crystallized ginger to your favorite recipes.